The Dreamcast GD-ROM Duplicator is a tool for Dreamcast developers which allows GD-ROMs to be duplicated. Users copy the contents of a disc onto the system's hard drive, and burn through a GD-Writer. 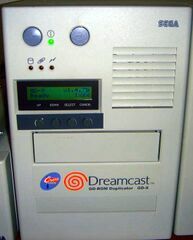 The design of this unit is very similar to the Dreamcast Development Kit, often leading to confusion between the two.